More than 40% of US hydropower is generated in the Northwest. California’s mountains reached their lowest snowpack level in the past 500 years during 2015. April snowpack in the Western United States has decreased by about 23% since 1955. By 2050, snowmelt in the Northwest US is expected to occur three to four weeks earlier than the 20th century average. In the winter, mountain snowpack is used for skiing and other snow-related recreational activities. This water source is even more useful in the spring and summer when it melts and releases water to sustain ecosystems, municipal and industrial water supplies, agriculture, and hydropower. As more precipitation falls as rain instead of snow in a warming climate, there is less snowpack available in the spring and summer. This increases the risk of drought, water scarcity, and large wildfires that negatively affects farmers, hydropower, drinking water, salmon, and recreation. For example, California’s average in-state hydropower generation during the first six months of each year from 2004 to 2013 was 20% of total power generation. In 2014, however, hydropower generation only accounted for 10% of California’s total generation due to ongoing drought and reduced snowpack. In California and other arid states west of the Rockies, snowmelt provides a critical fresh water supply in the summer and fall, when rainfall is sparse. The image below shows reduced snowpack at the Tuolumne River Basin in the Sierra Nevada in March 2015 compared to March 2010. This river basin supplies water to San Francisco and neighboring communities. The reduced snowpack makes it even harder for California to meet its water demands in the summer and fall during periods of low precipitation and drought. Discover more about your household water use and how you can save water at home. Learn about drought and its impacts in NEEF’s free online course, Dealing with Drought. From 1955 to 2015, April snowpack in the western United States declined at more than 90% of the sites measured. The map below shows the trends in April snowpack in the western United States. Blue circles represent increased snowpack and red circles represent decreased snowpack. 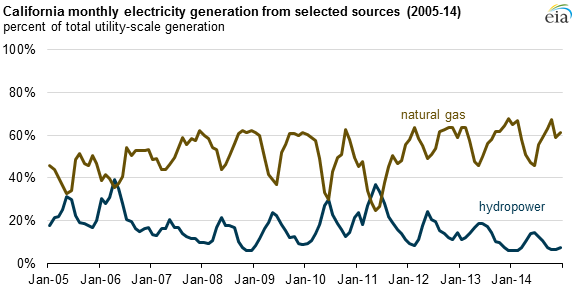 The graphs below show how a decrease in electricity generation from hydropower in California has been supplemented by an increase in natural gas, wind, and solar electricity generation.